In the early 1900's, the Costa family immigrated from Corleone, Sicily to America. They soon settled in California and opened a Sicilian Deli in the little Italy section of Los Angeles. Among the many foods that the Costa family offered, their handmade pasta quickly became their best selling item. Soon, local restaurant owners were demanding Costa pasta. 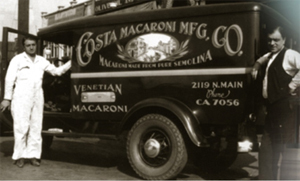 Costa Macaroni Manufacturing Company was born in 1923. Today, Pasta Montana continues in the rich tradition of producing the Costa brand in its state-of-the-art facility. Located in Great Falls MT, Pasta Montana is in the center of Montana's Golden Triangle, an area known for producing exceptional high protein durum wheat.